﻿ End of Tenancy Cleaning in London from Magic: A Fantastic Service! Our End of Tenancy Cleaning in London is available in ALL areas and allows our London carpet cleaners to provide a service of exceptional quality. 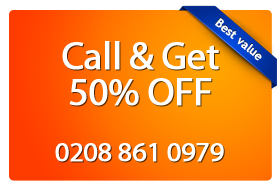 Get a free quote now by calling us on 0208 861 0979! We have regular cleaning contract from London estate agents, landlords and developers. Most of these contracts come as a referral from our previous End of Tenancy jobs. All of our clients are very satisfied with the cleaning services we provide. Our staff covers all of London and is fully trained in End of Tenancy cleaning services. London residential tenants know that a clean house is called a home. To us, this is a mission statement for End of Tenancy cleaning tasks. With all the areas of London covered, our cleaners team will always do a proper home cleaning. Also, our staff is fully qualified and trained — so your new home will be sparkling clean, waiting for you to move (back) into. Why should Londoners use our End of Tenancy cleaning services? For a long time, we’ve provided invaluable End of Tenancy cleaning services in London. All of our staff are fully trained and experienced. We closely work with both commercial and residential London clients. We help Londoners save money and time by delivering customised End of Tenancy cleaning services. Our London teams always bring in positive reviews of our End of Tenancy services, from Londoners. Most of our customers come as referral from previous cleaning jobs we’ve provided. We’ve stored some of our reviews about the End of Tenancy cleaning services on our reviews and testimonials page as evidence of the service level we provide.